1) At Connect 2014, IBM announced that Connect 2015 will take place from 25-29 January 2015. Given that this was such a public proclamation, I cannot believe that IBM would change this plan now. Therefore we are looking at what might happen post-January 2015. 2) The audience for IBM Connect is clearly shrinking over time. Efforts such as the rename from Lotusphere and the consolidation with Kenexa World haven’t made a significant difference to this trend, at least as far as I can see. In broad and probably over-simplistic terms, as new business-level attendees have been added, loyal technical-level folks have departed. That’s not to criticise any decision that’s been made, it’s just the state of the union – whether as a result of changes in the product lines, competitive positioning, loss of market share, marketing focus, cost of travel etc, the sad fact is that Connect doesn’t sell 10,000 tickets as it once did. Mark your calendar for February 22 – 26, 2015. We’ll meet at the Mandalay Bay Hotel and Casino and the MGM Grand Hotel and Casino in Las Vegas, Nevada. Next year’s expanded conference, with 20,000 attendees, will deliver even more compelling sessions, deeper insights from industry thought leaders, more meaningful networking opportunities and our biggest EXPO ever! b) Amongst the SWG ‘pillars’ (to use an old phrase), just IBM Insight (the DB2/Information On Demand conference) still stands alone, though it is also based in Las Vegas. It is scheduled for 26-30 October 2014.
c) Also, IBM Edge (Enterprise Infrastructure) is based in Las Vegas, scheduled for 11-15 May 2015. The IBM Partnerworld Leadership Conference is lined up for February 9-12 in Las Vegas. d) Given the above, the primary location for all large IBM global conferences is clearly now Las Vegas, and in many cases, bigger is better. 4) The Lotus IBM Collaboration Solutions brand no longer exists as a standalone entity. Under Craig Hayman it was made part of Software-as-a-service and Industry Solutions (or Industry and Cloud Solutions to keep the ICS moniker), but with Craig departing, there are suggestions that this will change once again. Either way, when was the last time we saw specific marketing for the collaboration product line from IBM? This means that the distinct brand and following are no longer reasons to have a separate conference with all the effort and cost that this entails. 5) The shift to the cloud. IBM’s ‘cloud first’ policy and the general direction in the marketplace is toward pre-packaged software-as-a-service offerings rather than on-premise ‘middleware’. This changes both the audience and the technical content of conferences as a result – I would posit that attendees are more likely to be line-of-business rather than IT-focused, and the emphasis will be on solutions and ISVs that can plumb multiple SaaS offerings together rather than the nuts and bolts of installation or application development. In the future, it could be suggested that there will be more commonality between say SoftLayer, IBM SmartCloud Connections and a Tivoli product for SaaS monitoring than there is between multiple ICS solutions today. Therefore larger conferences that bridge the gaps between the different brands that exist right now makes sense as we go forward. Given all the above, it is relatively easy to predict that IBM Connect as we know it (January in the Swan and Dolphin in Florida) will no longer exist after the previously announced event in 2015. This would be deeply sad in a lot of ways – so many of us have returned there on a regular basis over the last couple of decades, built business relationships, been exposed to new technologies, gained knowledge that has helped us build careers and perhaps more importantly, we’ve made and spent time with true friends around the world. However, it would also bring to a natural close the process that started perhaps five years ago, with the shift away from the Lotus brand. The name has gone, many of the people have moved on, the products and technologies have changed, and really the only physical thing that remains of the ‘glory days’ is the conference date and location. Shifting to Las Vegas as part of a packed global conference would be different for sure, but could offer real opportunities to customers and partners to make connections and gain knowledge and insight way beyond the traditional confines of the Connect event. Once again, I don’t know what IBM will do – I have no inside track. However, as I gaze into my virtual crystal ball, that’s what I expect will happen. However, I do have one major concern. All that I hear from the IBM financial results suggests that the USA is at best a static market for IBM – all the growth is taking place in Asia Pacific and in the BRIC countries (Brazil, Russia, India and China). Therefore I wonder why all the major conferences look as though they will be located in one USA city. Surely as a global brand operating worldwide, it seems odd (to me at least) that customers and partners in all areas of the world should be asked to pay to travel to a bizarrely located party-city in the Mojave desert to collaborate and associate with their peers. I do realise that many of the key IBMers that would attend are US-based, but even then, many of the R&D and support teams are being shifted to locations in other areas of the world. It would make more sense for these global conferences to be either located in Asia on a full time basis, or ideally, to be shifted around the world so that other sets of customers get the chance to attend. So that’s my 2c – IBM Connect 2015 will be the grand goodbye to Orlando, and we’ll be invited to attend a new conference in Las Vegas. However, what do you think? Is this the plan as you see it? Will you be sad to say goodbye to the memories made at the Swan and Dolphin in the past? Or will you look forward to new opportunities at a different event in the future? Might you change your plans and attend just to be at the last one? I’d love to hear from you! I’m not sure Vegas would give partners and customers more opportunity to make connections. The feedback from people who have attended Vegas conferences is that people tend to disappear off outside of sessions rather than connect. I can’t see there being the same kind of focal point in Mandalay Bay / MGM Grand as the Dolphin fountain provides at Connect. That would be one of my concerns as well, Paul. “grand goodbye”. It will be a squeak at most. I was talking to some people yesterday about the “cash cow” that Lotus used to be to IBM. I think this image sums up IBM’s treatment of the product line, it’s ability to make money and more importantly it’s own people….. Funny image, Darren! 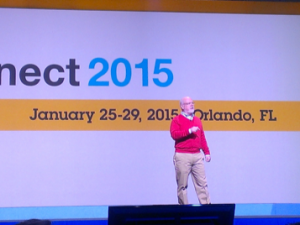 I was more meaning that the Lotusphere community would have a ‘Grand Goodbye’ to each other versus IBM laying one on. We’ve seen posts from many folks over the past few years saying that it will be their last time and how emotional it was. At least if we all know prior to Connect 2015 that it is the last one, then it gives community folks the chance to make plans accordingly. Actually, I feel it similar. What’s worse, I am afraid that Lotusphere (IBM Connect) will be appended as a minor and not as an equivalent track to the bigger event. I remember Lotusphere Europe in Berlin (and in Nice as well) as a complementary event to the main Lotusphere in Orlando. I would appreciate to have IBM Connect in Europe. Likewise Lubomir, I remember the Berlin events with fondness… I do think that whilst the LUGs have done a fantastic job of filling in for the absence of a major event in Europe over the past decade, the market here has definitely missed out on the ‘Lotusphere experience’ and sales and technical adoption have suffered as a result. Big shame if this is the way it’s going. In the last couple of years I was there I could sense the disquiet when there was a decline in the amount of Notes content. I’m not twisting the knife, this is an honest observation… Notes is disappearing fast and therefore it’s understandable that it gets less focus. Connections is a fantastic product, but from what I see it has fewer customers than Notes. From the point of view of a now-outsider, it also seemed that audience numbers were being bolstered by additional IBM staff and Florida students. I think that back when you left (3 years ago I think your recent blog post said? ), all the above was certainly true. However, my personal perspective is that since then the Notes/Domino user base has stabilised to a great extent, XPages is gaining greater adoption, and that Connections and Sametime are doing well. Acquiring Kenexa has also brought in a good number of new attendees and exhibitors. Personally, my observation is that in the larger enterprise space the last few Notes customers are either migrating now or plan to, and Sametime and Connections are nowhere… certainly in our top enterprise customers in the UK. At this point someone may say “but that’s Microsoft’s top customers”… no, that’s the top enterprise customers, which did include some of the biggest Notes customers in the past. Below that 400, in the sector that IBM call SMB, it may be a different story. One other point of view… when I was at IBM the Lotus brand pulled in a lot of attendees for customer events. When there were joint brand events where would be fewer attendees. Having said that, I think that Impact pulls in some big numbers these days. IBM Marketing … interesting combination of ideas. Considering that most of us will have to find anything else to do other than Notes/Domino (thankfully I’ve always had more than just that technology to work with) in the years to come, I predict you are right. Connections isn’t the same type of product, and it will never be as huge as Notes/Domino was. And no, Xpages will not save Notes/Domino. We will never ever see v10. I’m not sure what IBM’s thoughts are, or where they are going these days. And that has been their main problem: First there is no communication, and then they announce a lot of platforms or products that you never hear about again. The former Nordic Channel & Sales Manager for IBM Collaboration Solutions & Social Business in Norway never posted much on his Twitter and LinkedIn accounts in the past. In May he started working for Microsoft and he’s posting updates several times each day, promoting MS. Says it all, if you ask me. Picking out one particular point from your reply – I do think that having one big event every year with nothing in between would be a big mistake. That was one of the positives of the Lotusphere US & Europe arrangement of years gone by – two keynotes for announcements to be made, two bouts of press coverage, two sets of session material to share and so on. If the new model is to go for one huge consolidated event in Las Vegas every February then there will definitely need to be more news-worthy announcements made in between. I know that IBM has used ‘talking head’ style pre-recorded webcasts in the past to announce new releases, but I’m thinking of something more like the Apple ‘special events’ or the Microsoft /Nokia efforts to announce phones and tablets. I’m a little disappointed that this comment thread has taken a negative turn. Perhaps I didn’t make it clear enough in the post that I wouldn’t be criticising IBM if they made the decision to move Connect away from Orlando or consolidate it with other conferences – something has to change, and I’d applaud a strong and focused direction in terms of what comes next. We could choose to mull over the past, but the cold hard truth is that all technologies have their cycles of growth and popularity – there aren’t many people attending conferences focused on OS/2, CP/M or Cobol these days. Sure, there are some passionate advocates out there, but not enough to sustain a 5,000+ person tech conference! The reality is that whilst a pure Notes and Domino conference would attract a good number of attendees, it likely wouldn’t need somewhere the size of the Swan and Dolphin, nor would meet IBM’s needs in terms of sales opportunity and press coverage. The IBM Connections product suite (as it will be later this year – Chat, Mail etc) are strong solutions that generate decent market share, are well respected by analysts and have many loyal customers. I would argue that, even in these days of online communities and ubiquitous social media coverage, there needs to be at least one IBM-run tech conference that allows professionals from around the world to gather to hear announcements, be educated on features and technology, debate best practices, share case studies and build community. The question is what form should that take? The Connections suite is broad and feature-rich enough that it almost demands its own event, especially if you blend the technical with the business potential of social collaboration. Whatever my allegiance now, I believe that Connections is a great product… and funny that for so many years IBM / Lotus didn’t pay attention to the UI of Notes, but that was one of the things they got right very quickly with Connections. I think you are right, and actually commented to my colleagues early this year about the exact same prediction. 1) Of course it will be the end of an era. Kimono’s, Jelly Rolls, Dolphin Lobby and all the goodness of Magical Disney. The Dolphin/Swan has always been a great location for a great event. I will be a little bit sad if this does end up happening. 2) While I am not a fan of Vegas, I do not think the location has much to do with the event that Lotusphere/Connect became over the years. Actually I would suggest that had it always been run in Vegas it would have developed the same culture and spirit that it has in Orlando regardless. and a 3rd point if I may;) There are some big positives if this happens. The ability to learn across a much greater range of technologies/topics maybe. The ability to meet new people. And the ability to re-invigorate the conference. Should it move to Vegas it is up to the community to make it successful. At the end of the day I don’t think IBM influences much the culture of the events. It has always, and it always will be, the attendees that make it a great event. So lets embrace a new conference, lets make it the next Lotusphere, lets go find a new sushi serving karaoke bar in Vegas!